Of course, we’ll have to see if this tech is still state-of-the-art three years down the road. An electronic component that offers a new way to squeeze more data into computers and portable gadgets is set to go into production in just a couple of years. Hewlett-Packard announced today that it has entered an agreement with the Korean electronics manufacturer Hynix Semiconductor to make the components, called “memristors,” starting in 2013. Storage devices made of memristors will allow PCs, cellphones, and servers to store more and switch on instantly. Making memories: This colorized atomic-force microscopy image shows 17 memristors. The circuit elements, shown in green, are formed at the crossroads of metal nanowires. Memristors are nanoscale electronic switches that have a variable resistance, and can retain their resistance even when the power is switched off. This makes them similar to the transistors used to store data in flash memory. But memristors are considerably smaller–as small as three nanometers. In contrast, manufacturers are experimenting with flash memory components that are 20 nanometers in size. “The goal is to be at least double whatever flash memory is in three years–we know we’ll beat flash in speed, power, and endurance, and we want to beat it in density, too,” says Stanley Williams, a senior fellow at HP who has been developing memristors in his lab for about five years. Don’t call ’em hard drives — but I will –with no moving parts and increasingly large amounts of storage. What’s not to like? Toshiba said Thursday that it will soon offer samples of 512G-byte solid-state drives, which could make their way to laptops and other devices by mid- or late next year. Storage capacities of solid-state drives, or SSDs, are doubling every few months, but Toshiba’s 512G-byte SSD is the highest storage capacity announced for SSDs intended for consumer devices like laptops. Most PC makers today offer 128G-byte SSDs for laptops, and competitor Samsung recently said it put into mass production 256G-byte SSDs, which will become available in a few months. SSDs store data on flash memory chips and are often compared to hard drives. SSDs consume less power and have no moving parts, making them a good storage option for laptops compared to hard drives, which store data on magnetic platters. However, SSDs provide less storage capacity and are more expensive than hard drives. In a down market one company is still innovating. Flash memory is a major reason for the ubiquity of handheld gadgets, from MP3 players to video games. But this year has been rough on companies that manufacture flash memory chips. Supply is outstripping demand, as the economic downturn has many people postponing purchase of the newest gadgets. Research firm iSuppli projects that worldwide flash revenue will plummet 14 percent in 2008 and slip another 15 percent in 2009. And Toshiba, the second-largest flash manufacturer, announced that it would slash production by 30 percent next year, after posting the lowest profit in four years. Amid all this turmoil, however, Swiss memory startup Numonyx has announced a slew of new high-capacity flash products that cover a broad range of applications. There are chips designed to be integrated into devices such as mobile phones and navigation systems, added as storage in computers, and used in high-capacity memory cards. The new chips have transistors that measure only 41 nanometers across, down from the 48 to 57 nanometers of Numonyx’s previous chips. Fabio Gualandris, vice president and general manager of the data management group at Numonyx, says that the 41-nanometer chips indicate the company’s rapid progress since April, when it was launched to commercialize technology from Intel and STMicroelectronics. 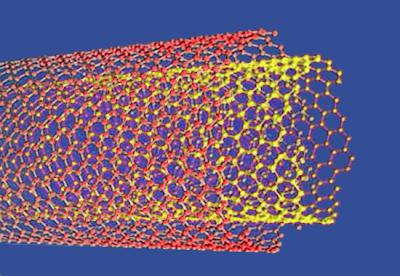 From KurzweilAI.net — This sounds like another huge breakthrough utilizing carbon nanotubes. Researchers at The University of Nottingham have used carbon nanotubes to make fast non-volatile memory. If one nanotube sits inside another — slightly larger — one, the inner tube will ‘float’ within the outer, responding to electrostatic, van der Waals and capillary forces. Passing power through the nanotubes allows the inner tube to be pushed in and out of the outer tube. This telescoping action can either connect or disconnect the inner tube to an electrode, creating the ‘zero’ or ‘one’ states required to store information using binary code. When the power source is switched off, van der Waals force — which governs attraction between molecules — keeps the Inner tube in contact with the electrode. This makes the memory storage non-volatile, like Flash memory. Current Flash chips are estimated to have a useful lifetime of around a decade for most applications. However, some applications that require repeated writing and rewriting of data can theoretically cause cells to wear out much faster, sometimes rendering a Flash device useless within a few years. This can happen when a large area of Flash memory is used as a swap file or virtual memory, or to store constantly updated log files. The continuing miniaturisation of conventional Flash memory chips also threatens to reduce their lifetime. This and other factors make conventional high-density Flash cells unworkable at circuit sizes below 20 nanometres, the scientists claim. The new ferroelectric Nand Flash memory cell developed by the Japanese scientists can be scaled down to at least 10 nanometres. The next generation of conventional flash cells will use a 30 nanometre circuit density. The ferroelectric Flash memory cell can be rewritten more than 100 million times, compared to a conventional cells lifetime of around 10,000, its inventors claim. To prolong their life Flash memory chips use a ‘wear-levelling’ process in which all cells are used equally, and worn out cells are ‘retired’ without disabling the whole chip. The ferroelectric cells use a rewriting voltage of fewer than six volts, compared to about 20 volts for conventional chips. Flash memory chips with a potential lifetime of hundreds of years and a lower rewriting voltage have been developed by University of Tokyo scientists. Current Flash chips are estimated to have a useful lifetime of around a decade or less for most applications.